I was teaching a class the other day. We were reading a class novel. In a part of the story, there was an uncle who said that boys fight as a part of growing up. I opened this up for discussion because the school's theme for the month is respect. I mentioned two boys in the class who I know have been in fights (because I have had to break them up) and mentioned that I know they are not afraid of fighting. They smiled in agreement. 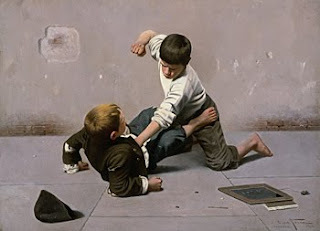 I asked the class if they believed that fighting is a natural part of growing up. Most of the students said yes. I strongly objected. I then mentioned that I had never been in a fight with anyone. Mouths dropped! Some of the students could not believe it. I told them that I have never been in a fight at school, or even with my brother. I said that I believe that there are different ways of being able to handle yourself and different confrontational situations. "You have never been in a fight? ", a young lady said. "Not even in a fight with your brother or an argument? ", another said. "No. I think you can be successful and still handle situations differently." I then continued on with the story. I looked up every now and then and saw some of the students were still stunned.